1. The attention of the Nigerian Army has been drawn to the unfortunate statement made by a former Chief of Army Staff, Lieutenant General Theophilus Yakubu Danjuma, during the convocation ceremony of the Taraba State University on Saturday 24 March 2018 in which he categorically asserted that the Armed Forces of Nigeria was colluding with militias and other criminal elements and was unable to provide security for the citizens of Taraba State. He further called the people of Taraba State to take up arms and defend themselves. 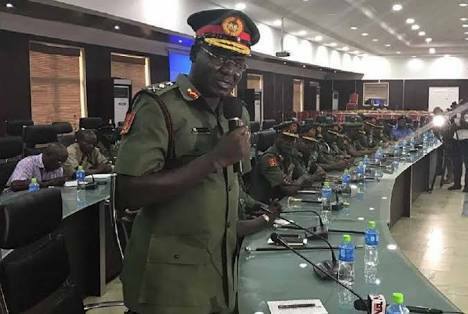 The Nigerian Army views this statement made by the former Chief of Army Staff as most unfortunate at this critical time that the military has embarked upon demilitarisation of the North Central Region of the Country. a. The Nigerian Army is constitutionally charged with the responsibility of defending the territorial integrity of Nigeria and to aid the civil authority whenever called upon to do so. In this light, the authorisation for the conduct of Ex AYEM AKPATUMA was authorised and troops deployed to curb menace of the herdsmen-farmers conflict and other criminal activities in the North Central Region amongst others. b. It is on record that the successes so far achieved in Ex AYEM AKPATUMA have been recognised and accepted by Nigerians. c. The public is notified that Nigerian Army personnel have had to pay the supreme price for ensuring the sustenance of security in Taraba State. For instance, a gallant non-commission officer of the Nigerian Army was beheaded on 16 March 2018 in Takum Taraba State by criminal elements. d. It is noteworthy to state that at the inception of Ex AYEM AKPATUMA, the Taraba State Government, did not cooperate with the Nigerian Army due to the Army’s stance to remain absolutely neutral in the herdsmen-farmers crisis. The Nigerian Army will continue to remain as such. e. For avoidance of doubt, the Nigerian Army advises the people of Taraba State and indeed all other Nigerians to continue in their day-to-day activities and be law abiding as anyone caught with arms and ammunition will be dealt with accordance with the laws of the land. Every law-abiding citizen is assured of equal protection and security of their lives and property irrespective of his/her person. 3. You are please requested to disseminate this information to the general public through your reputable medium. 4. Thank you for your usual cooperation.